When I was in college, I would rush to my mailbox after class with my fingers crossed. It was usually empty, except for the occasional catalog or some junk addressed to the student before me. But sometimes, oh sometimes there'd be a little slip inside that told me I had a package. A package! It was always a good day when that happened. What, you're wondering, does this have to do with fitness? Nothing really. Except that I got a package in the mail yesterday that contained a very important book—What to Eat, by Marion Nestle. (And yes, I had the book sent to myself. But it still made yesterday a very good day!) Marion is a public health professional and college professor who specializes in nutrition and food studies. I discovered her book at my local library, and have been checking it out at random for the past month or two. But not anymore! Now it's there for you, that is, if you go to the same library I do. Otherwise, you'll have to discover it at your own library, or Borders. And I highly recommend that you do. It's an easy read with perfectly paced chapters that feature a lot of subheadings—which makes it a book you can pick up and put down at random (unlike the Tana French suspense/thriller I also ordered, slightly pictured above). Ok, but what's it about? The grocery store! Marion takes you on an aisle-by-aisle tour, dishing out equal parts politics and nutrition. 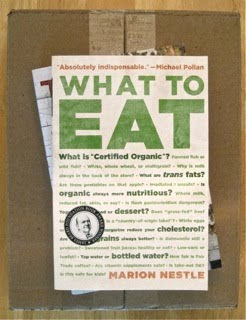 Sample chapter titles include "Organics: Hype or Hope," "Yogurt: Health Food or Dessert," and "A Range of Meaty Issues." She's quick to tell you that it isn't a diet book, so don't expect recipes and rules. But she will help you understand the the food industry, which should then help you make smarter choices at the grocery store. Sad. I'm a horrible mom. I should have written you more in college even though you WERE only 15 minutes away. ...but I got to come home (usually with 12 friends in tow) to a nice meal whenever I wanted. And when you're stuck with dining hall food, trust me. Nothing is better. And I got flowers at every holiday. You're the best, mom.